Open your fashion horizons simply by wearing a white suit vest from Contempo. The suit vest isn't just something you put on and wear. 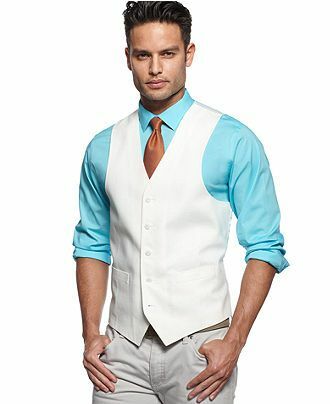 You will see that by wearing this white suit vest, your entire style changes up just that quickly. It's sort of like wearing a hat but for your torso. The white suit vest isn't just a vest that is white but adds that certain something to your entire look just like a hat does to your head. You'll love the way you look when you go out wearing this white suit vest. Made of poly/rayon.